First things first... have you Donated to Al's Run yet? Reflecting back on the post on Top 100 recruits, who would have guessed that Junior Cadougan would end up as one of the recruits to get an incomplete in their first year? Tough break for the player. 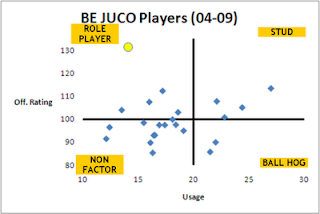 Anyways, as discussed, I wanted to take a look at what the typical expectations are for JUCO's in their first year. This time, I pulled data from JucoJunction.com and ran that through the ringer. For the data, we went back to 2004-2005, because that was as far back as Pomeroy's database goes. Over this period (2004-2009), there were thirty-four JUCOs that committed to BE teams and played in the first year. The team with the most JUCO players was Cincinnati (nine). I know that you all find that to be very shocking. Of course, there are two JUCO players joining the team this year in Dwight Buycks and Darius Johnson-Odom. The hyperbole surrounding both of these recruits has been very high. We've seen Buycks referred to as "one of the best JUCO guards in the nation", and expectations are also high for DJO. Not only that, but Jimmy Butler was outstanding last year, raising expectations even higher. But what does history tell us? If you recall the post on Top 100 recruits, the distribution was fairly even between the different categories. About 25% of the players that got playing time ended up in the Stud, Role Player, Ball Hog, or Non-Factor categories. (As a reminder, the breakdown is average number of possessions (20%) vs average offensive rating (100)). However, the story is not distributed nearly as evenly over the past five years. Only four JUCO players ended up as Studs (offensive rating > 100 ; possessions > 20%). Four. Their names are Kentrell Gransberry, Rodney Epperson, John Williamson, and Jihad Muhammad. Twenty-three of the thirty-four JUCO players were non-factors, with both sub-par offensive ratings and limited possessions. That's the great big group on the bottom left. 68%, if you will. Only five of the JUCO players were even quality role players in their first year. Top of the list was actually our very own Jimmy Butler, who is the big yellow circle up way up above anyone else. Butler was off the charts good as a role player. Frankly, what this limited set of information suggests is that it is rare for a first year JUCO player to be more than a complete non-factor, let alone a legitimate stud. Given that Butler was so good last year, my fear is that the expectations may be just a little bit too high for Buycks and DJO.